I was a high school student in the early 2000s when eBay really began to gain traction. The site was my first foray into the world of ecommerce, and it soon became my go-to place to blow my allowance on much-coveted Juicy Couture and Abercrombie & Fitch items. During my time as an avid shopper of the marketplace, I picked up on an important tip: Don’t trust stock images. If an item featured a stock image rather than a photo from the owner, I knew there was a good chance the product could be fake. I’ve carried this hunch with me to this day. Stock images aren’t always enough to convince me to purchase an item. I need more; I need to be sure the item isn’t of poor quality, and that I can actually pull it off in real life. I’m not alone here. A 2014 study by social media agency Laundry Service found that “Instagram-style” shots see click-through rates as high as 8%, compared with 2.35% for studio shots and stock photos. To top it off, because the consumers of today have the world at their fingertips, they are likelier to do research about a business’s back-end before making a purchase. Gen Y consumers are quick to call out a brand hiding behind ingenuine practices, and they aren’t afraid to spread the word if something seems off. Fortunately, the marketers of today are cognizant of the millennial need for transparency before deciding to buy. Here are five who understand that keeping it real is required to thrive in today’s market. Many BuzzFeed articles and Tumblr posts have been dedicated to poking fun at the way some fast food restaurants portray their meals in marketing copy vs. how the food actually looks in real life. I’ve never seen Shake Shack make it onto one of these lists that feature advertisements of burgers with frozen cheese and perfectly lined toppings. On the contrary, the brand embraces images of melted, gooey cheese and messy toppings on its burgers. 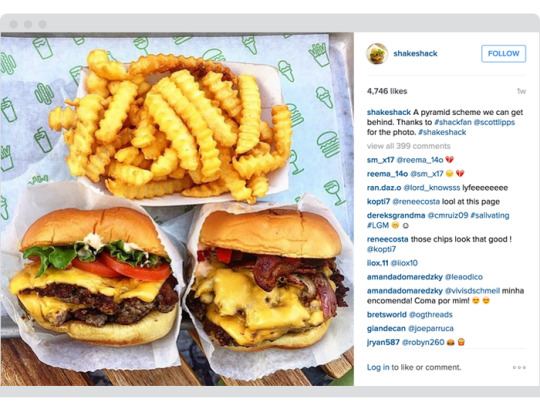 Shake Shack shares tons of consumer-generated photos on their Instagram feed too, encouraging satisfied fans to join the conversation. Nothing looks staged, which played a huge role in Goldman Sachs’ findings earlier this year that Shake Shack has undoubtedly won over the millennial generation. Pretty much all of the content on Airbnb.com is user-generated. Of course, all Airbnb inventory comes from its users, so it doesn’t get more authentic than that. The brand does a great job of showing off its unique listings to consumers. 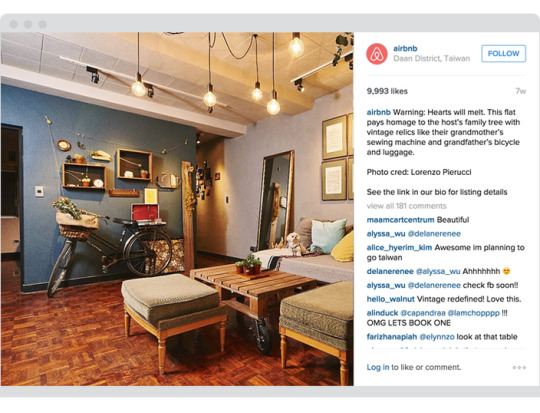 On Instagram, Airbnb features one-of-a-kind photos and provides some detail about what makes these spaces special. Seeing content like this really strikes a chord with millennial travelers. The opportunity to stay in a unique home with character and a backstory as opposed to a standard hotel room appeals to younger demographics. In fact, Airbnb is starting to cause a slight disruption in the hotel industry. A 2014 Boston University report found that a 10% increase in Airbnb supply results in a 0.35% decrease in hotel room revenue. Of course, not every brand can be an Airbnb, but the company is a prime example of how it pays off to demonstrate the ways in which your products or services enable authentic experiences. Everlane was built on transparency. Its business model is reliant on creating luxury-quality items and making people aware of exactly how these products were made, including manufacturing costs and warehouse details. With frequent media reports about businesses relying on cheap labor to make high-end products, Everlane’s strategy goes over well with millennials. The company uses imagery on its social channels and ecommerce pages to support this business model. On Snapchat, for example, the brand held a session to share behind-the-scenes images from their knit factory as well as takeaways from the factory’s workplace assessment report. 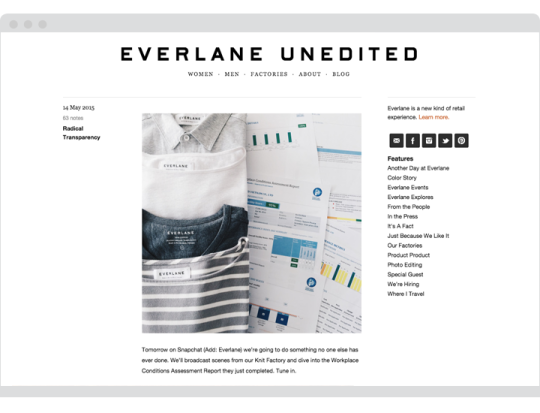 The images are featured across Everlane’s social properties, including Tumblr and Instagram, in addition to their ecommerce site. By displaying raw footage from their factory on product detail pages, Everlane makes their customers feel good about their purchases. Millennials like to know the ins and outs of the businesses they purchase from, according to Moorea Seal, founder of the eponymous brand. She exemplifies this perfectly on her Instagram feed. Moorea is big on showcasing her interactions with her local community. Take, for example, a photo she posted of a retiring UPS associate who handled deliveries at the Moorea Seal brick-and-mortar shop. 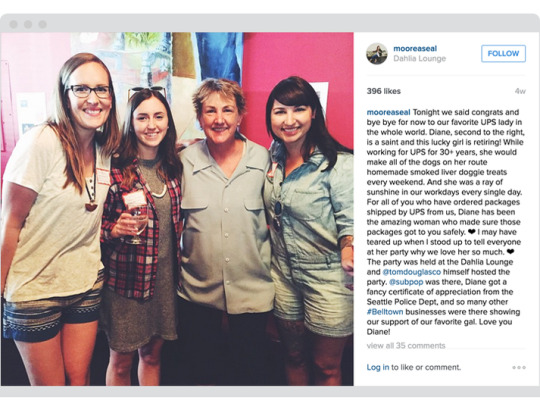 Moorea and her team threw a goodbye party for the woman, whose services they really came to appreciate. Photos like this one demonstrate that the Moorea Seal brand is more than about accessories and home goods; it’s about community and giving back. That goes a long way with Gen Y consumers. Nothing says, “keeping it real” like showing actual people using your products. 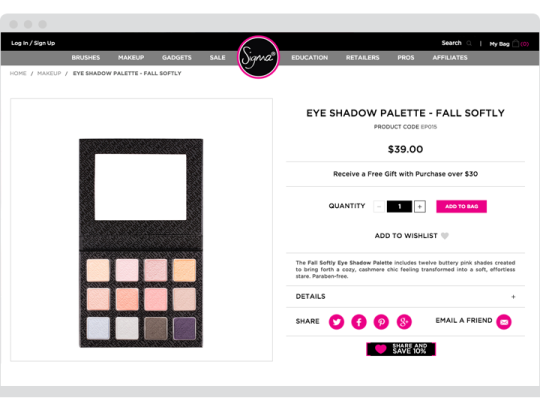 Sigma Beauty is a master at employing user-generated content to connect more deeply with their customers on social channels and their website. For example, the brand features some four to five user-generated images on their Instagram feed each day, and uses the Curalate Fanreel solution to feature user images on dedicated product pages. For Sigma, this tactic works well. Amber Mulle, Social Media Strategist at Sigma Beauty, told us that consumers are 5x as likely to make a purchase when they see it on another customer vs. when they see a branded photo or stock image of a product in someone’s hand. Authenticity is key to reaching millennial consumers. They don’t just care about what you sell – they care about how you make it and how you market it as well.